Dec 07, 2015 in "Gran Fiesta Tour Starring The Three Caballeros"
Walt Disney Imagineering brought a welcome surprise to Epcot's World Showcase on Friday with the unveiling of a new audio-animatronic finale to the Mexico Pavilion's Gran Fiesta Tour Starring the Three Caballeros. 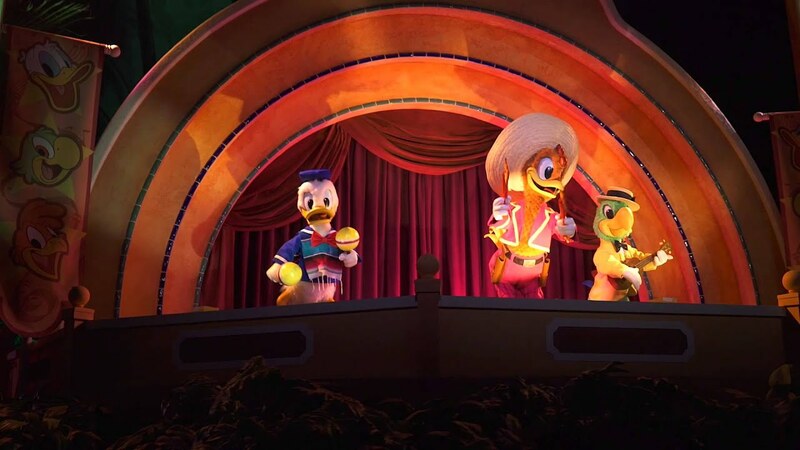 In place of the former animated movie scene that formed the attractions finale since its major refurbishment in 2007, three audio-animatronics figures now complete the ride with Panchito, José Carioca, and Donald Duck taking the stage. The figures are actually from the Magic Kingdom's Mickey Mouse Revue, which closed in 1980, moving to Tokyo Disneyland in 1983. The three animatronics performed as part of that show until 2009, and have since appeared at various special events, but now have a permanent home again at Walt Disney World in Epcot. A new sign outside of the attraction was also installed as part of the updates on Friday.